Metal roofing is one of the most durable, and is popular with companies as well as homeowners! There might not be as many options like asphalt shingles, however, whichever option you choose, both have impressive durability. 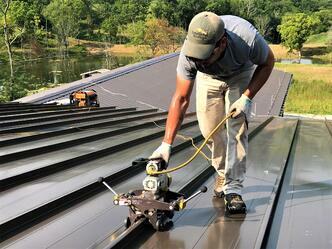 More popular due to its superior durability and sleek look, standing seam is becoming more and more common. (Pictures seen above) Many home owners are incorporating standing seam metal for porch coverings or shed rooftops while many businesses and corporations will use it as their primary rooftop protection! Yet with its higher durability and looks comes a higher price than barn style sheet metal. Sheet metal was the standard metal rooftop for most manufacturers and farmers. Not only is it cheaper, but the installation was less complex usually quicker. (Depending on the job) While it may not have the sheen of standing seam, it does the job and provides suitable protection! Metal roofing provides some of the best roofing protection for large manufacturers or home owners! However, its superior qualities come at a considerable price, so it may not be for everybody. 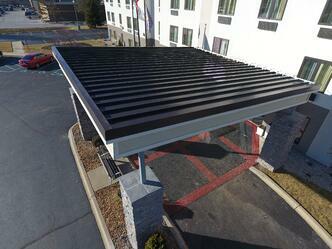 There are multiple types of flat roofing, most of which are popular with large scale corporations! While some homeowners may have flat roofing sections, it is more commonly seen with commercial buildings, restaurants, manufacturers, etc. Installation and repairs are much easier and less visible in many cases as well. 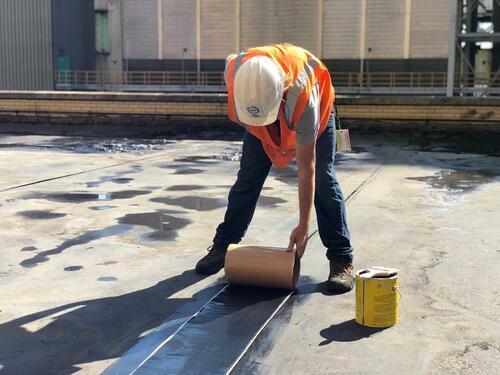 Flat roofing membrane has become one of the most popular choices for roofing protection in the recent years, especially for businesses and manufacturers. Metal roof recovers are done with this membrane, and is less intrusive than other repair methods given the fact that the old roof does not need to be removed! 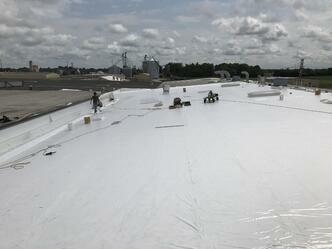 Like barn metal, rubber roofing was the most common flat roofing option before PVC membrane came along. The installation process is not as "user-friendly" however, repairs are quick, easy, and affordable; all three of which may be what a cost-concerned business is looking for! 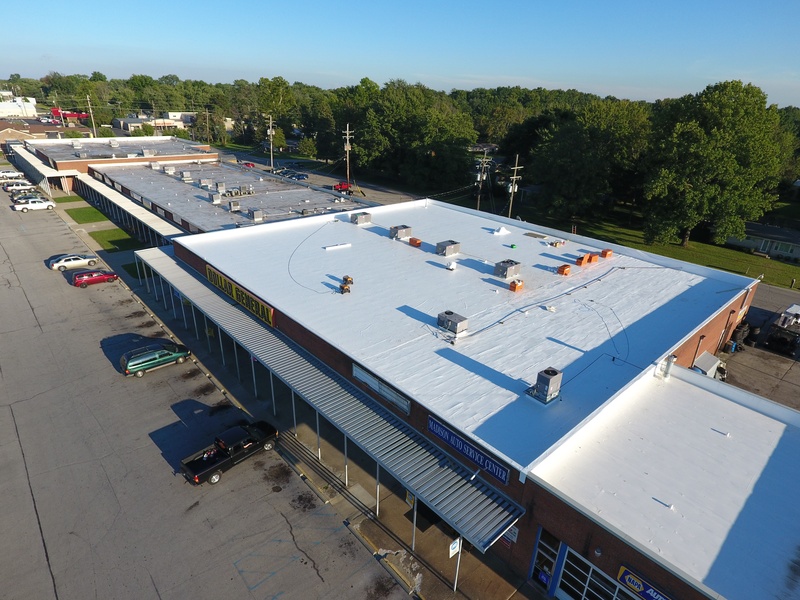 Schools, manufacturers, and some businesses still use rubber roofing as their main protection. 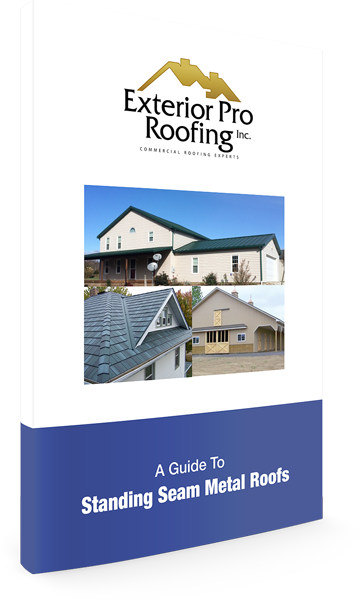 While it may seem like we covered all there is to know about roofing types, we still have more to go! Again we hope this blog gave you a good idea of what to look for when it comes to your own projects. See you in the next blog!